Rogue River, OR (November 2012) – Wagner Meters is very proud to announce that their new DataMaster™ – designed to protect data integrity for RH testing and reporting – has been nominated for the 2013 Most Innovative Products (MIP) Award at World Of Concrete. Wagner Meters has been built on a history of combining proven technology with an innovative application, as demonstrated when their original Rapid RH® won the prestigious MIP Award in 2006. The DataMaster™ continues that tradition by combining Bluetooth® technology, touch screen controls and the proven Rapid RH® reputation for accurate and easy RH testing. The new DataMaster™ allows instant and repeatable data tracking on any test site using the Rapid RH® 4.0 EX to monitor the internal relative humidity of the concrete. The DataMaster™ also collects ambient relative humidity and temperature and calculates dew point conditions for the given environment. Once data is collected, the DataMaster™ allows flooring and installation experts to upload complete data to www.f2170reports.com for reporting, sharing and archiving. Smart Sensor serial numbers are also collected and compared with the on-site database to confirm calibration, and that verification is included on each report generated. Records can also be exported to Excel spreadsheets for record-keeping, trending or other data analysis. With a clear understanding of the importance of job site accuracy during concrete slab and flooring installation, Wagner Meters puts the power of industry compliance at your fingertips with the new MIP-nominated DataMaster™. The DataMaster™ truly provides an innovative solution for maintaining job site documentation and data integrity. More information about the new DataMaster™. 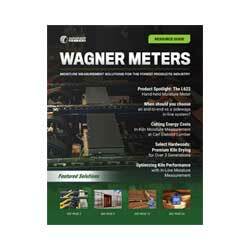 With advanced technology, accurate measurements and unsurpassed customer service, Wagner Meters’ full line of moisture measurement tools offers a solid investment for your workplace. To learn more, visit www.RapidRH.com or drop by booth S11610 at World of Concrete, February 5-8, 2013.